Biolabs Anti-Cellulite Formula Reviews | Does It Work? Nobody likes cellulite. That dimply, uneven appearance of the skin around the buttocks, stomach, and thighs is usually the result of aging skin and uneven fat deposits, not to mention fluid retention and inflammation. But there are ways to decrease these problems and reduce the appearance of cellulite, even from the privacy of your own home. Biolabs Anti-Cellulite Formula is one such cream which promises to help you end your cellulite woes. But can they make good on that promise? Our review of this anti-cellulite formula is designed to give you the answers you need so that you can make a well-informed decision as a consumer. For more information, keep reading below. What is Biolabs Anti-Cellulite Formula? 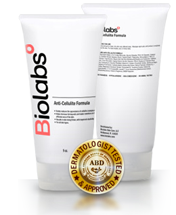 Biolabs Anti-Cellulite Formula is designed to help reduce the appearance of cellulite on your skin. It claims to be able to do so using natural ingredients which will not irritate the skin. Another plus for Biolabs is that they do not test their products on animals, which will be pleasing to the environmentally conscious. But to see whether Biolabs can make good on their cellulite reduction promises, we need to take a good look at the formula's active ingredients. Caffeine - This ingredient is nearly universal when it comes to anti-cellulite creams. Caffeine is the bane of cellulite's existence; it works to smooth your skin and eliminate cellulite in many different ways. It helps to flush excess fluid from your system, tightens and tones skin's surface, and also enhances your body's ability to metabolize the fat deposits which are creating those unsightly cellulite lumps. Bladderwrack Extract - This healthy seaweed extract has several beneficial properties, especially for cellulite treatment. For the most part, it acts as an anti-inflammatory agent which reduces the swelling and bunching of cells, giving your skin a sleeker appearance. It also helps caffeine drain excess fluids and improves circulation beneath the surface. L-Carnitine - The building blocks of your body are referred to as "amino acids", and L-Carnitine is one of them. The Biolabs formula uses it to help rebuild old, loose skin to give you a firmer and more youthful appearance. Centella Asiatica Extract - This herbal ingredient can sometimes be found listed as Gotu Kola, depending on where you look. Much like Bladderwrack, Centella has anti-inflammatory properties and helps rid your body of unnecessary fluids. It also has a detoxifying effect. There are many different online retailers which offer the Biolabs Anti-Cellulite Formula to customers. On average, it sells for just under $80 per 4 oz tube, and most websites will offer at least a 30-day money back guarantee if you are unsatisfied with the purchase. Does the Biolabs Anti-Cellulite Formula Work? In our experience, the Biolabs Anti-Cellulite Formula worked well enough to earn itself a spot on our list of top cellulite creams. It is relatively easy to find and has several impressive ingredients for the reduction of cellulite. But it couldn't beat out our top two picks. If you want to find out what those are, just click here and check out our reviews section for answers.